Ink Stick Size: 4.75"x 1.25" x 0.5"
Premium quality Chinese ink stick. Famous brand: Lao Hu Kai Wen. Chinese ink sticks have been used for thousands of years to create ink for calligraphy and watercolor paintings. 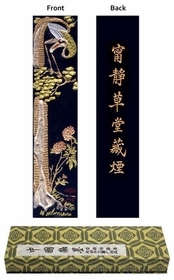 This Chinese calligraphy ink stick is decorated with traditional Chinese crane and pine tree. In the Chinese culture, the cranes symbolize longevity, the pine tree symbolizes longevity / eternal youth and steadfastness. This ink stick may be used for writing calligraphy or watercolor painting. To create ink using this ink stick simply add a little water to an ink stone and rub the ink stick on the bottom until the desired amount of pigment is released. The traditional Chinese brush drawing medium is ink in stick form. The pigment is derived from burning tungoil or pinewood in earthenware. The soot is collected, mixed with glue, perfumed, then formed in varied shapes through wooden moulds. A well treated ink stick can last for long time for moderate uses. Wipe it clean and let it air dry after each use. Always store it in a dry place and avoid direct sunlight and draft.